Yesterday I had the opportunity to participate in a soccer program for 20 children who live under a bridge. My experience with soccer has been that it is the “everyman” game–all you need is a ball and some space and you can play. That is not really the case here in Jakarta. Mostly, people here play “footsal” or indoor soccer. In order to play indoor soccer you have to not only have the money to rent a court, but you have to have the right equipment. The reason people play indoor soccer is not only because it is very hot outside, but also because there isn’t a lot of free space outside for traditional soccer. When I first signed up to volunteer I didn’t realize what a big deal this was for the kids. The kids we played with don’t own a soccer ball–they kick around a round piece of plastic and play in a small alley. The ally has to be too small for a car to pass through, though–or there will be cars passing through and they will get run over. Needless to say, they were thrilled to get to play with a real ball on a real court. We played on a sand court so shoes weren’t an issue and the kids had a blast. The kids were divided up into two groups and taught different types of passing. To me it seemed pretty basic–but the kids absolutely loved it and needed to learn the skills. After the two 30-minute passing sessions they got to play 5 on 5 tournament style. I finally know how to cheer for soccer teams in Indonesian–so that’s an added side benefit! I know I keep saying it, but I was just overwhelmed with how happy the kids looked. I talked to the head coach after and he said that the reason this is so special to the kids is because they literally have nothing to do. That’s why they get married around 14. It’s something to do. The goal of the program is not only to teach them soccer skills, but it is for them to learn about themselves and learn that there is more to life…and I am so excited to get to be a part of it. 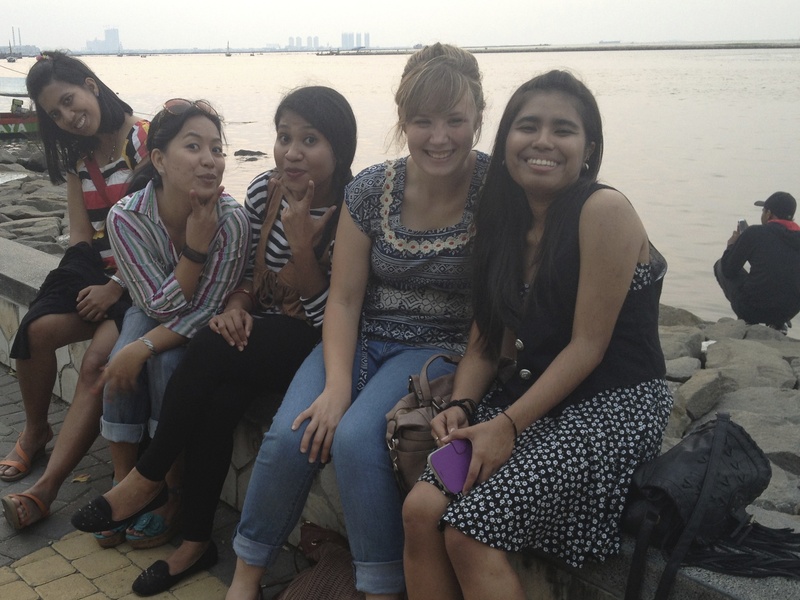 I can’t believe I’ve been in Indonesia for a whole month! The good news, is that I am still glad that I decided to move here! It feels like just yesterday that I was landing in the Jakarta airport—but at the same time, it feels like I’ve been here a lot longer than just one month. 5. 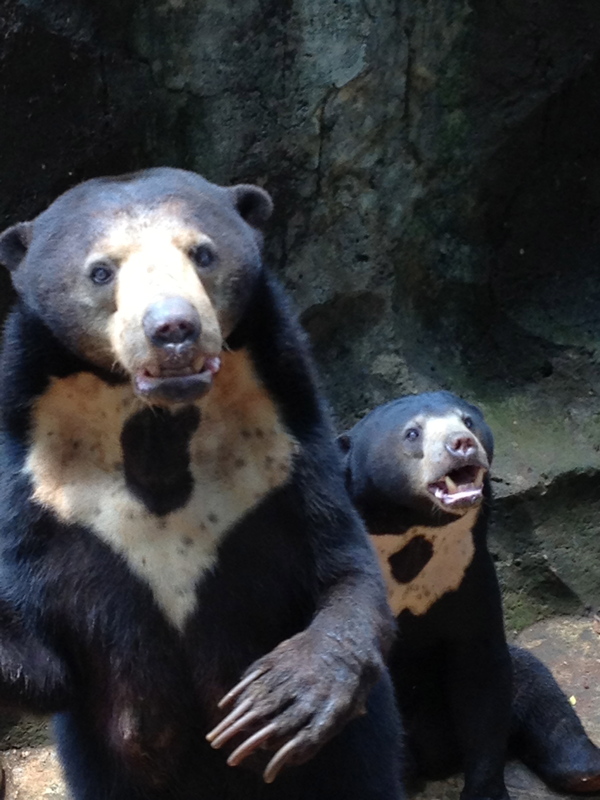 Sun bear exhibit…they’re just so cute!! I know there’s a lot more to come in the next few months, and I’m more excited than ever! I have decided that my favorite form of public transportation is an ojek. An ojek is a small motorcycle/moped that recklessly zooms around town. I have now ridden on one multiple times and it is quite the adventure! Ojek drivers don’t really follow traffic rules and have a very different sense of special relations. For example, two feet between a giant truck and a traffic cone is plenty of space to zoom through in order to get ahead of traffic. Even though they are crazy drivers and every time I ride one I’m pretty sure we’re going to crash—I love the feel of the wind in my face, zooming past all the other vehicles. When I first rode one I had to hang on for dear life. Now that I’ve ridden a couple times, I can even ride without hardly hanging on at all—I just grab the hook on the back of the seat and hope that’s good enough balance. I think I like it because I feel like I’m living on the edge…the edge of what, though, who knows! my new sun bear friend! Ever since I found out that the sun bear is native to Indonesia, I have wanted to see one. Upon arriving in Jakarta, I quickly found out that they do not dwell on the island of Java, except in the zoo. While not the ideal way to see a sun bear—by going to the zoo, I would at least be able to see the sun bear in it’s native country. Yesterday, Korry, Venus, and I went to the Jakarta zoo and it was quite the zoo experience. There was no map, just random paths that didn’t connect with signs pointing in contradicting directions. We randomly decided to start walking to the left and see if that took us towards the sun bears. Within a few minutes we had seen lions and tigers and orangutans (also native to Indonesia)—but no sun bears. 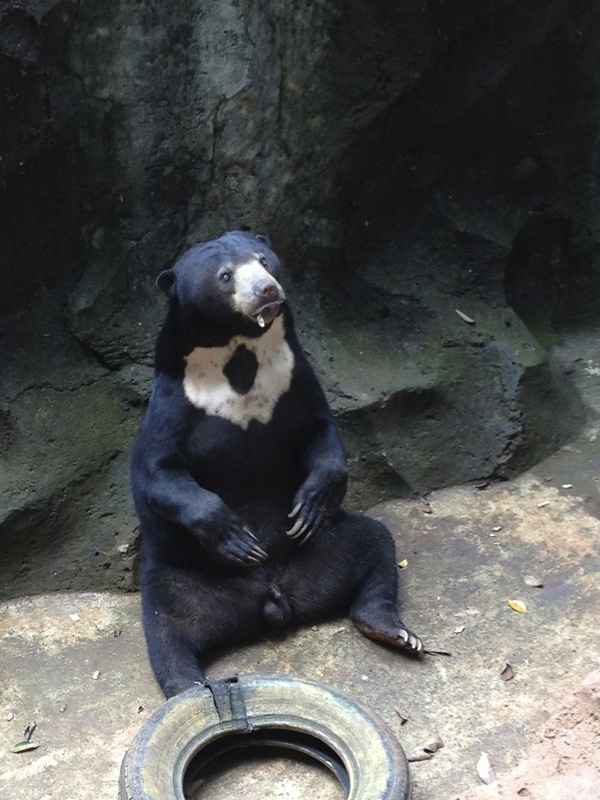 After asking around and aimlessly wandering for a while, we finally happened upon the first sun bear exhibit. The bears were so cute!! They were cuter in real life than in any of the pictures I had seen of them. The tourists next to us were throwing them bits of fruit and they were catching them in their mouths, it was hilarious! The rest of the exhibits were great too—but none matched the fun and enthusiasm of the bears. It further confirmed that I am, in fact, obsessed with bears. Communities, traffic, and my first power outage! Saturday I had the opportunity to go back to the trash dump community for our September outreach project. 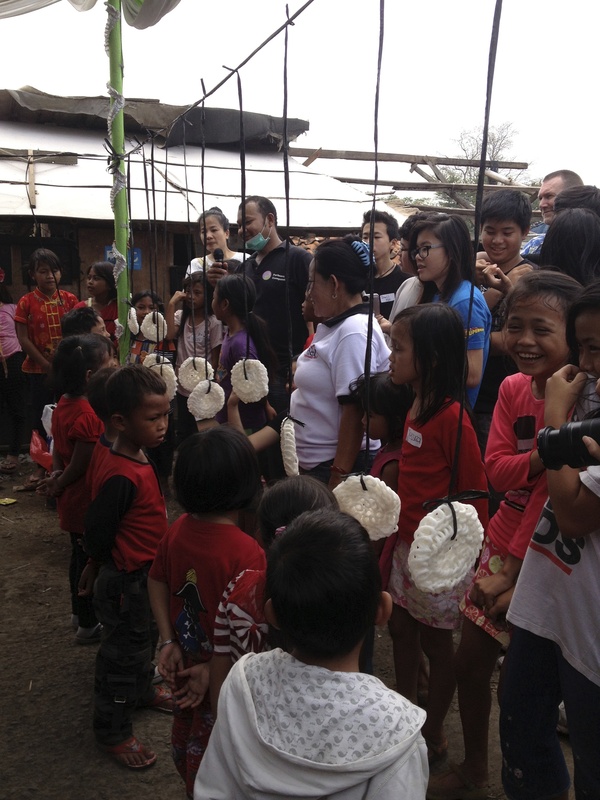 We offered a free medical clinic and kids games for the community. By the end of the day, we had treated over 400 patients and played with about 75 kids. The children were so cute and I had so much fun watching them play. We had a drawing competition, a karaoke competition, a krupuk (Indonesian rice cake) eating competition, and a blind-folded makeup contest. It was an exhausting day, but everyone had fun. 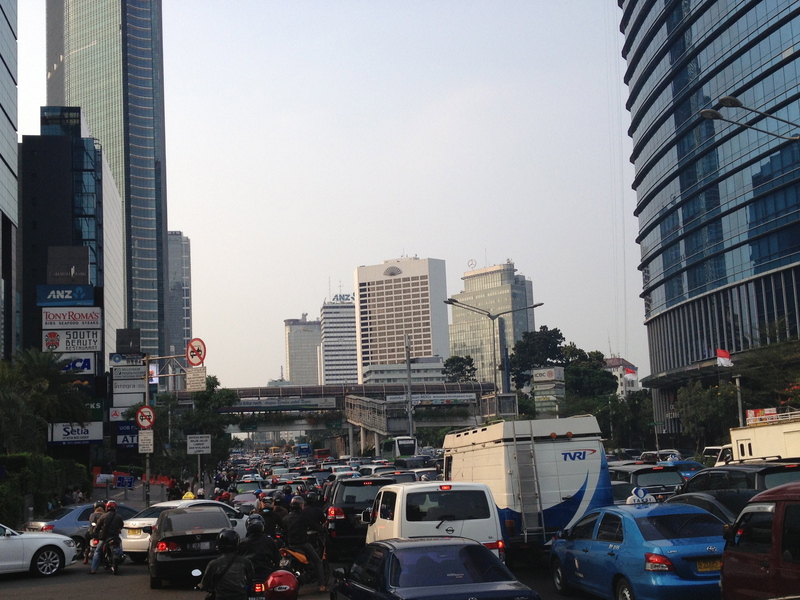 On the way back to the office from the trash dump outreach we got stuck in the legendary Jakarta traffic. After about 45 minutes of barely moving, we decided it would be a good idea to get out and walk the remaining one mile to the office. We figured even if we didn’t actually get there faster, at least we would be moving. It ended up taking us 18 minutes to walk to the office–and the car didn’t get here for another hour. When I got home late that night, my power was out. I am living in a third world country, so I figured it was about time for there to be a power outage. I mean, I hadn’t even had a legitimate reason to use my headlamp yet! Though slightly excited to have a power outage (yes, weird I know), I still found it odd that the living room still had power…just my room didn’t. But I was exhausted, so didn’t really analyze the situation, I just pulled out my handy dandy headlamp, got ready for bed, and went to sleep. In the morning, though, my power still wasn’t back on–but it was in the rest of the house. Even in a third world country that doesn’t seem normal. I mean you would think that the power would be all the way on, or all the way off. Finally after a few hours of being up I decided to ask Korry if she could talk to the people and see what was wrong. Apparently each room has it’s own fuse box, and mine got turned off for some reason. So even though I had an unnecessary power outage–at least I’ve had one! I can’t believe I’ve been in Indonesia for a week! It feels like I just got here and like I’ve been here for months all at the same time–I guess what’s what jet lag will do to you. It has been quite the week. I started work the day after I got back, which was great! So far I’ve been able to eat lots of Indonesian food, pretty much all of which I’ve liked. My favorite at the moment is nasi gorge ayam–chicken fried rice. It has to have a little bit of spice in it–but not the full Indonesian about, because that will kill you. Yesterday I had the opportunity to visit two of the communities where Partners for Compassion has projects–Cilincing and Muara Baru. Cilincing is a trash dump community in the eastern side of Jakarta. Currently we have a kindergarten with 34 students. The school backs right up to the dump…well really the whole community backs up to the dump. I had the opportunity to walk part way up the trash mountain and it blew my mind. The men work every day it doesn’t rain separating the trash into piles that they can sell. I wasn’t able to figure out who they sell the stuff too, but they sell 99%ish of what they sort. I think what blew me away the most was the utter joy the little 4 and 5 year olds had at being in school. We got there at the end of the day, so they were mostly just coloring–but they were absolutely loving it! Granted, an Indonesian slum community kindergarten is a little more haphazard that you would probably find in America, but I’m pretty sure there is no group of children more excited to be in school. When it was time for them to go home, a lot of them came up to us and shook our hands and put their head on our hand, a sign of respect to their elders. I guess I’m getting old enough that I’m considered an elder, yikes!! The second community, Muara Baru was slightly less of a shock after seeing the trash dump community, but the conditions were still unbelievable. I think what was most exciting about that visit was the utter passion of the partners we work with there. I could just tell how much they love their community and how much they want to be involved in helping to love and serve them. They asked if I would come and do a guest English lecture to the kindergarteners, so hopefully I will get to meet and play with some of the kids! There has been a lot going on, and it’s hard to summarize everything in one post. It has been quite the ride this week—but it has made me so excited to be here and to be a part of brining love and hope to the women and children of Jakarta! !